30 years after the closure of Polmaise No 3 and 4 Pits, it is important to remember the significance of the achievement of the coal industry and the men who made it. Recent additions to the Stirling Smith collections include a Stirling District Council publication, Polmaise, The Facts, arguing the hard economic case for this particular mine to stay open. Polmaise was a record – breaking, productive pit and this photograph from the late 1970s encapsulates some of its style and strength. 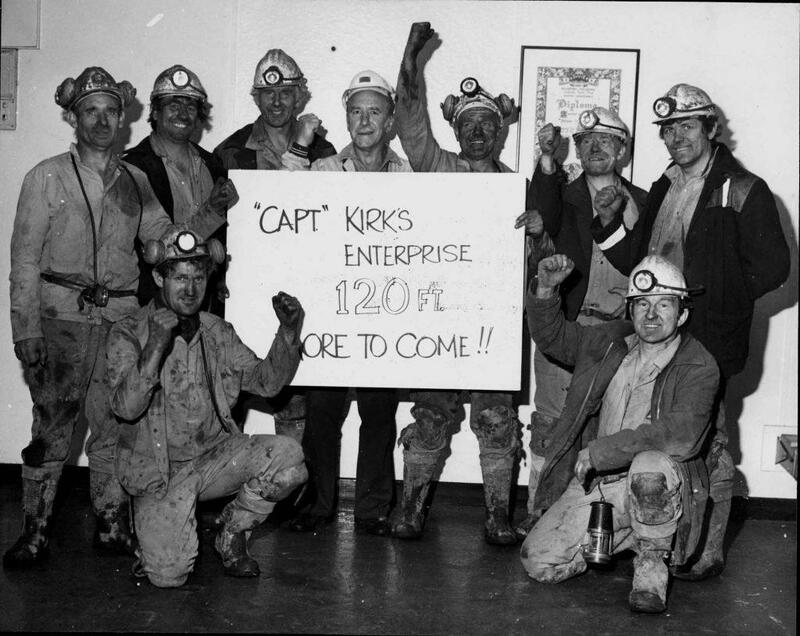 This was a period of extension for the pit, and the men are characterised as being like the fictional Captain Kirk of the Star Ship Enterprise ‘going where no man has gone before’. In the back row, they are from left to right, developer Bill Beresford, John Smith, deputy Jim White, pool leader / mine driver Peter Moran, and pans back up men Arthur Mackie and George Steven. Kneeling at the front is developer Bill Haughton (left) and shot firer Bill Hamilton (right). Bill ‘Boo’ Haughton of Fallin first qualified as a miner in 1970 at Comrie, and went on to train as a developer and driver, opening up new seams and working in the specialist Mines Rescue Service. This photograph is one of the treasures of his working life.